This course is designed for personnel interested in teaching the 10- and 30-hour construction industry safety and health outreach program to their employees and other interested groups. Special emphasis is placed on topics that are required in the 10- and 30-hour programs as well as on topics that are the most hazardous, using OSHA standards as a guide. Course participants are briefed on effective instructional approaches and the effective use of visual aids and handouts. 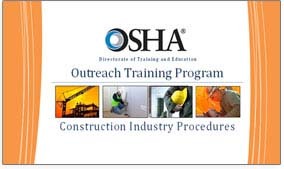 This course allows the student to become a trainer in the Outreach Program, to lead both a 10- and 30-hour construction industry safety and health course, and to issue cards to participants verifying course completion. Prerequisites: Course #510 and five years of construction industry safety experience. A college degree in occupational safety and health, a Certified Safety Professional (CSP), or a Certified Industrial Hygienist (CIH) designation in the applicable training area, may be substituted for two years of experience. You cannot register for this course until your prerequisites have been verified. Click here to download the verification form. Once you have submitted the form and it has been approved, you will receive a registration code that will allow you to register for this course. For additional information on becoming a Construction Industry Authorized Trainer, click here to go to the trainer page. NOTE: Students in this course who wish to participate as authorized trainers in the Outreach Program must successfully pass a written exam at the end of this course. Outreach trainers are required to attend Course #502 at least once every four years to maintain their trainer status. The registration fee for this course includes a printed copy of the 29CFR 1926 standard, various handout material, and electronic copies of selected presentation materials. Participants are provided with documentation and instructions to aid them in being successful Outreach Instructors. This course is delivered in person using a combination of lectures, audio/visual presentations, group workshops, and hands-on demonstrations. All participants in this course will be required to prepare and conduct a short training session on a topic or topics assigned by the instructor during the workshop.